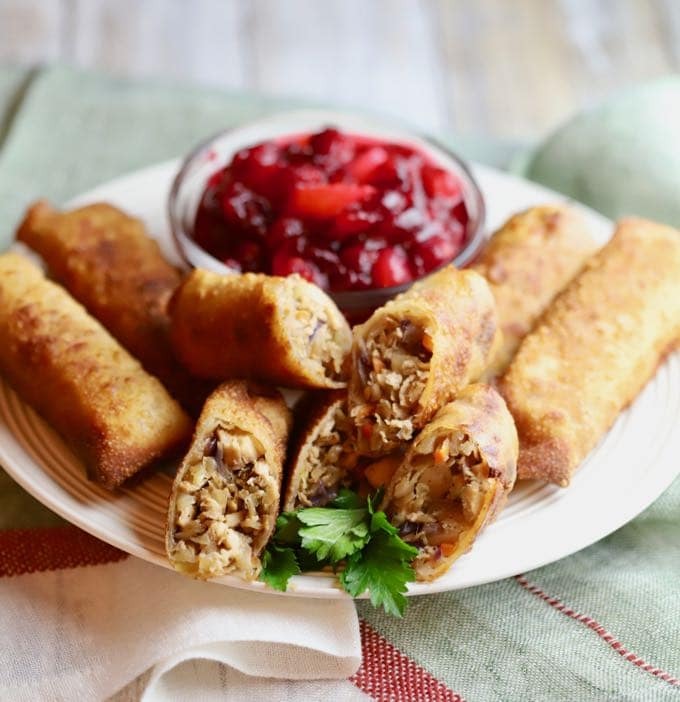 Crispy and delicious, Easy Leftover Turkey Egg Rolls with cranberry dipping sauce is the answer to the age-old question, what to do with the leftover Thanksgiving turkey? 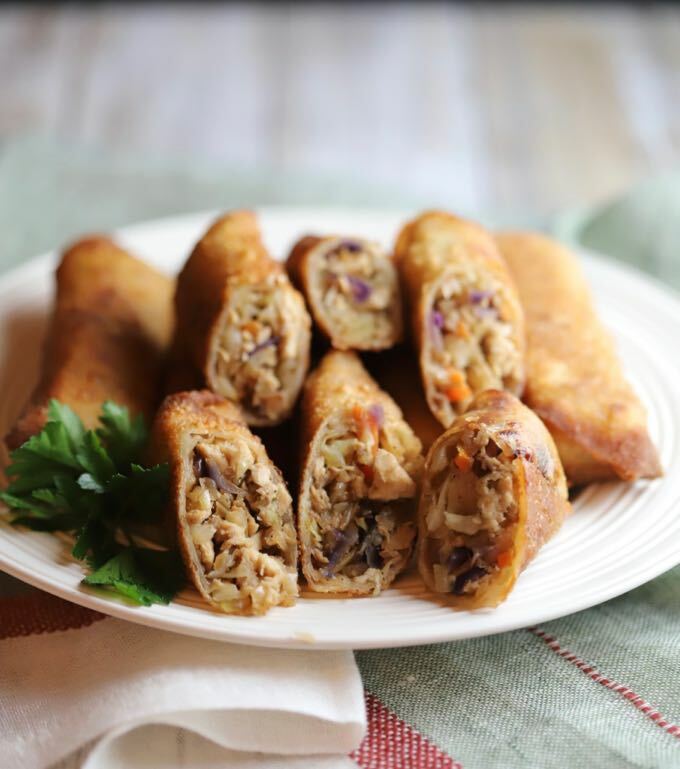 In this turkey egg roll recipe, I’m combining leftover turkey with nutritious, crunchy cabbage and carrots in a tasty hand-held treat your family will love! You could cut them up and serve as appetizers, or they make a delicious side dish. 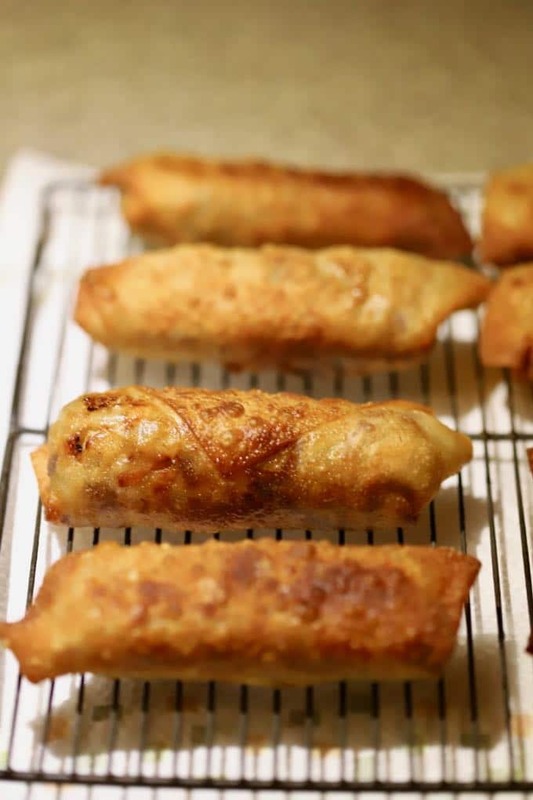 Yes, I know, egg rolls are not what you typically think of when you think of Thanksgiving leftovers! However, they are a versatile and delicious way to wrap up any number of ingredients in a crispy and flavorful package. Think eggs, bacon, and cheese for a breakfast egg roll, or how about combining apples and cinnamon, or even adding leftover pumpkin pie for a tasty dessert? See what I mean? The possibilities are endless. 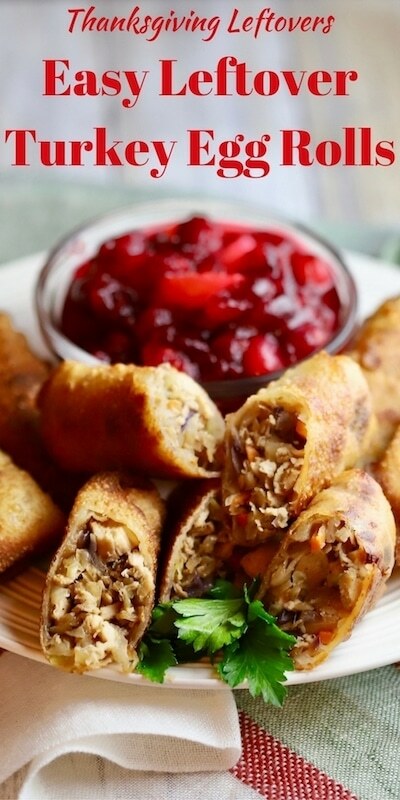 I also experimented with several different variations of a dipping sauce for the turkey egg rolls using leftover cranberry sauce with apples and oranges, but in the end, I came full circle and the sweet and tart cranberry sauce by itself ended up being the perfect match. The only ingredients you will need to make this Easy Leftover Turkey Egg Roll Recipe are a package of egg roll wrappers, leftover cooked turkey, a bag of coleslaw mix, kosher salt, ground black pepper, ground ginger, low-sodium soy sauce, garlic powder, and vegetable or peanut oil for frying. Combine the coleslaw mix, chopped turkey, garlic powder, kosher salt, pepper, soy sauce, and ginger in a large bowl and mix well. 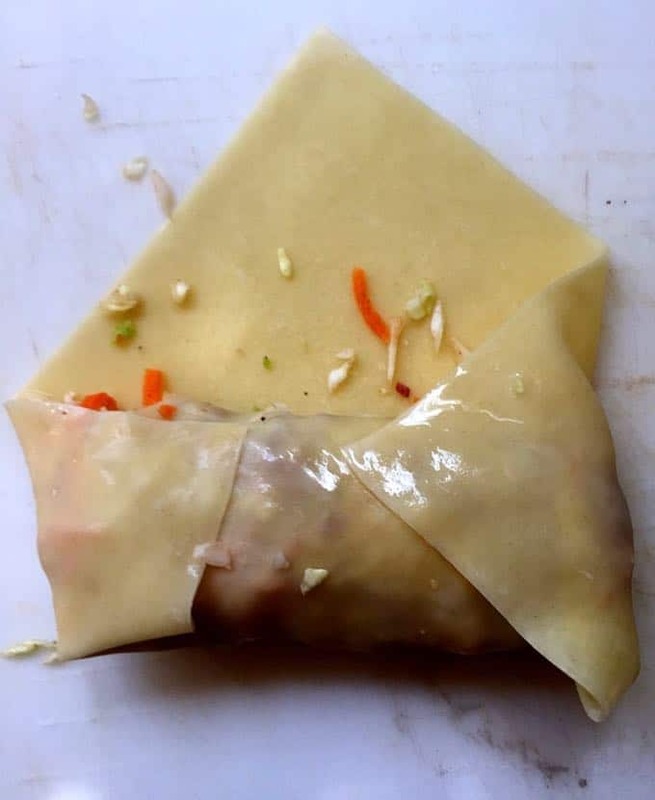 To fill the egg rolls, place about 1/3 of a cup of the coleslaw mixture diagonally on the bottom of the wrapper. Fold the bottom corner over the filling, roll snugly half-way to cover the filling. 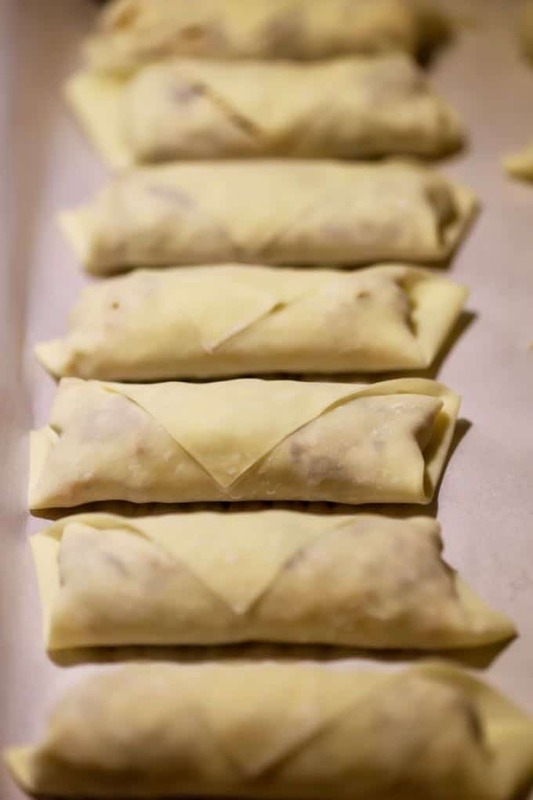 Fold in both sides tightly against the filling and moisten the edges of the flaps with water. Press down. Finish by rolling the wrapper up and seal the top by moistening the flap and pressing down. 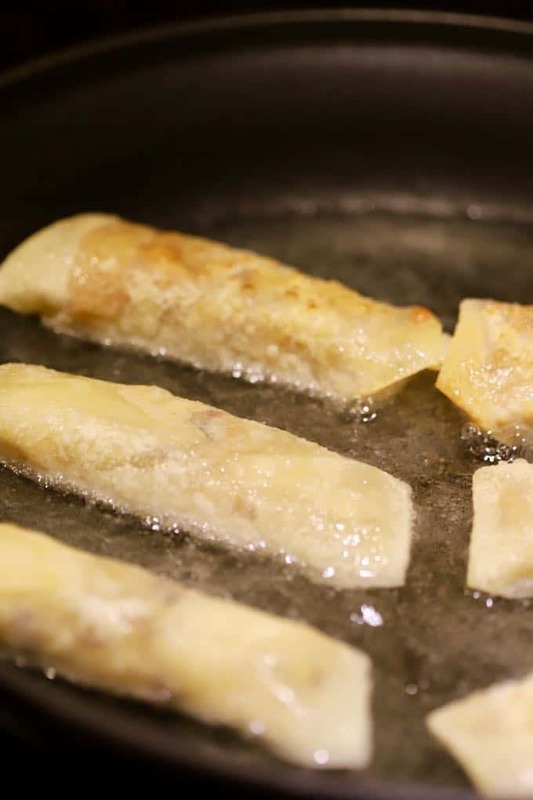 To fry the egg rolls, heat about 1/2 inch of oil in large skillet over medium-high heat to 350 degrees. Place the egg rolls, seam side down, a few at a time, turning occasionally and fry until they are golden brown. This only takes 2-3 minutes, watch them carefully. Remove and drain on a rack or paper towels. Serve immediately with leftover cranberry sauce, if desired. Easy, crispy, and delicious Leftover Turkey Eggs Rolls with cranberry dipping sauce is the answer to the age-old question, what to do with the leftover turkey. 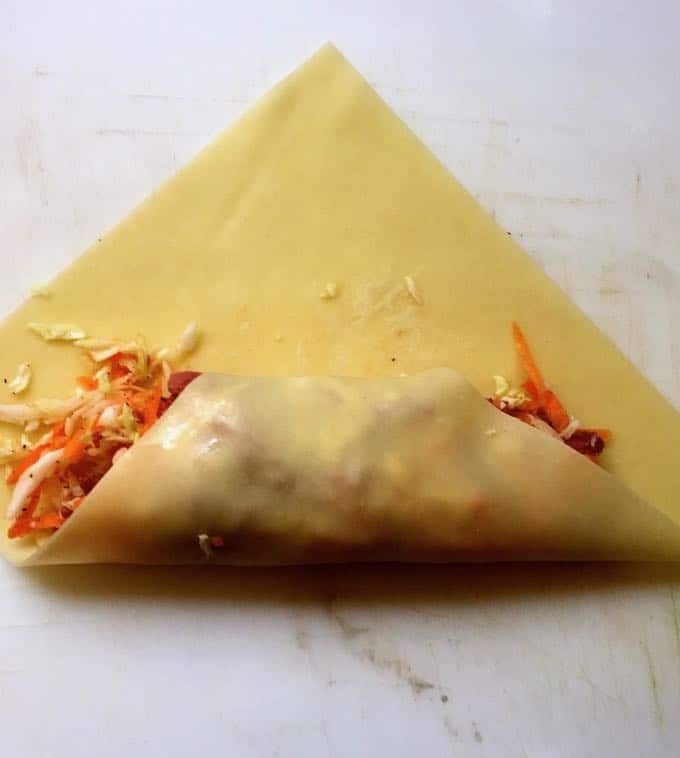 To fill the egg rolls, place about 1/3 of a cup of the coleslaw mixture diagonally on the wrapper.